Have you ever seen such amazing lace as this? of a skirt or similar clothing? but aren't they just stunning? Perhaps you can inform me as to how they were used??!! which has been fashioned into another collar insert. A close up view of it's delicacy! Take a look at this incredibly beautiful piece. who gave me this exquisite gift to me. and pass down to her very own daughters. 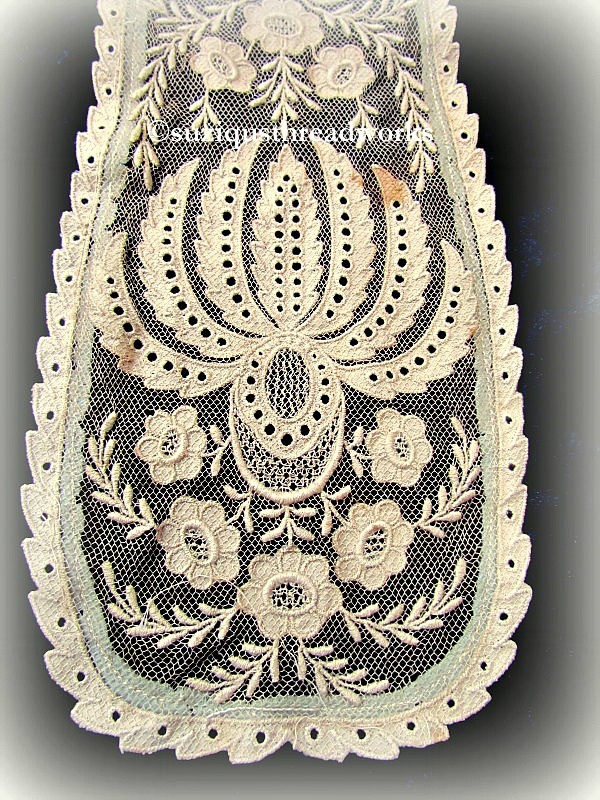 Look at that beautiful paisley effect through the lace. It probably spans about 4 metres across now! garden paradise so I could share it here with you! I feel so blessed for it all! "Thank you from my heart"
Such divine lace!! What an incredible gift! I'm sure your friend will treasure the beautiful collage you made her. 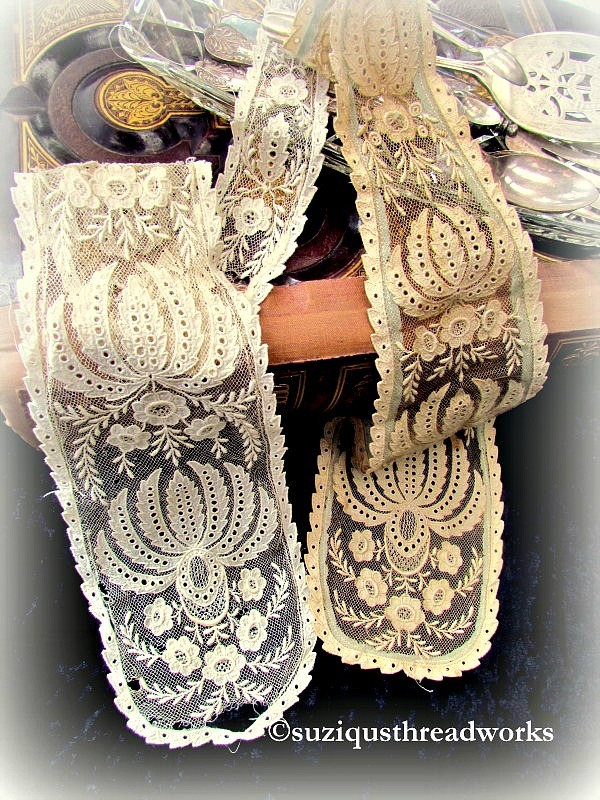 Wow...what gorgeous laces! !..and I just adore your personal stunning collage...absolutely gorgeous! 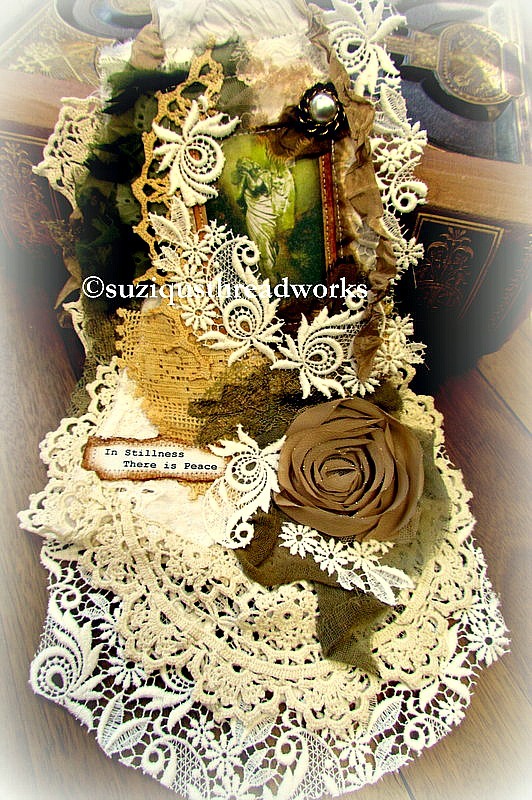 !such a beautiful keepsake!! Thank-you for the show n tell of such exquisite beauty.Old laces like that are a real pleasure. Personally, if the collar is still intact, Id frame it. The laces are exquisite. Can you imagine the time and patience it takes to make those pieces. When my daughter was little, I made dresses for my mom, me, and her, all of black velvet, all with beautiful lace collars. I have a picture somewhere of this generational moment, and seeing your post brought that back. 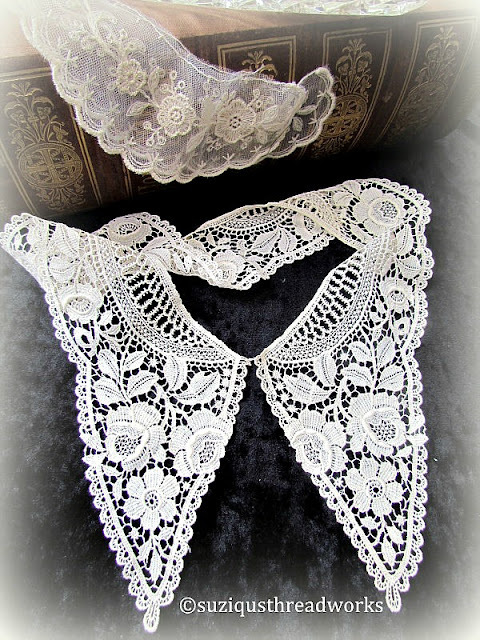 These collars turned otherwise simple dresses into elegant displays. This Lace is absolutly wonderful! You can iagine the dress which was with it!!!! Wahou!!! Soon, you'll see what I found in other "vide-greniers", but it's not so marvellous! You're lucky to comme to spring, here fall is coming slowly!!! 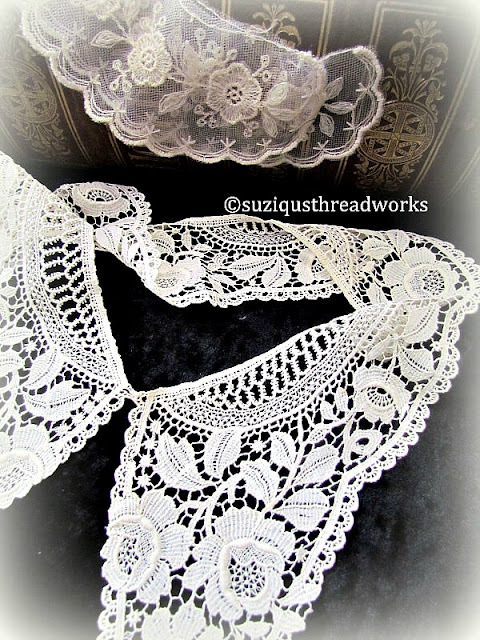 These collars and other lace pieces are just exquisite, my dear Suzy! What a wonderful gift and you've created a stunning collage using some of that lace. Di must have been very thrilled to receive it. Your cherry tree is beautiful. I just love blooming trees. Enjoy your wonderful spring garden, sweetie! 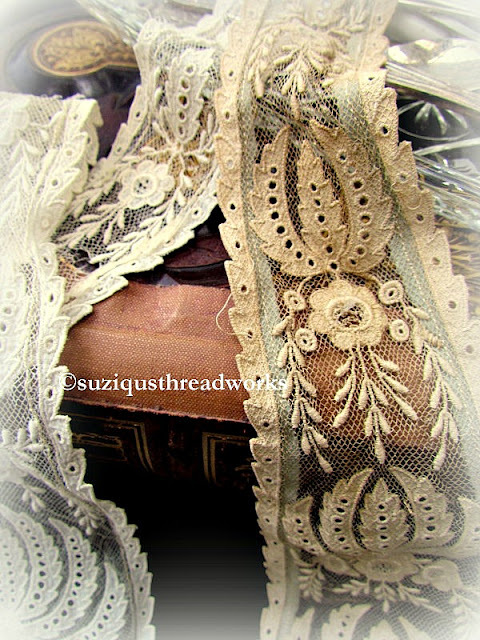 Exquisite lace Suzy, you are truly blessed to receive these lovely gifts. A lovely gift to return to your friend, a treasure to most certainly be passed down. 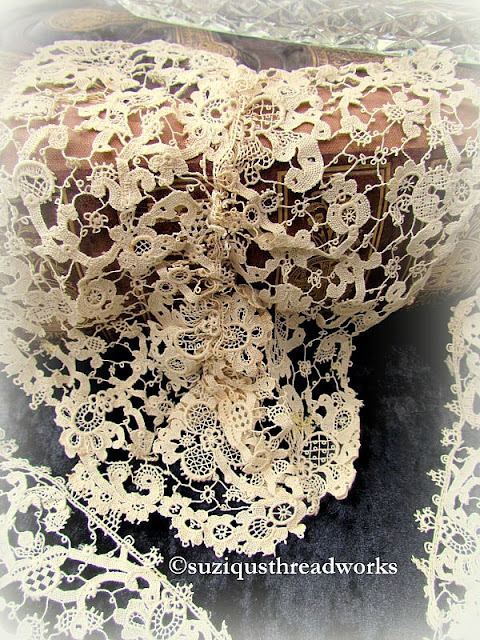 Such stunning gifts you was given, they truly all knows that you will treasure and create fabolous pieces with some of those very beautiful laces-and some I guess you will save as is, to the future. Your collage to Di is gorgeous, sweetie, she will love it as you love the beauty from her past ,too! And speaking about beauty, nothing could be more lovely ,than that tree - OH so full of flowers, and so incredible pretty colour - you have the most sweet and beautiful spring, my friend. Sending you loving thoughts, and wishes you a happy friday, Suzy. Omg. 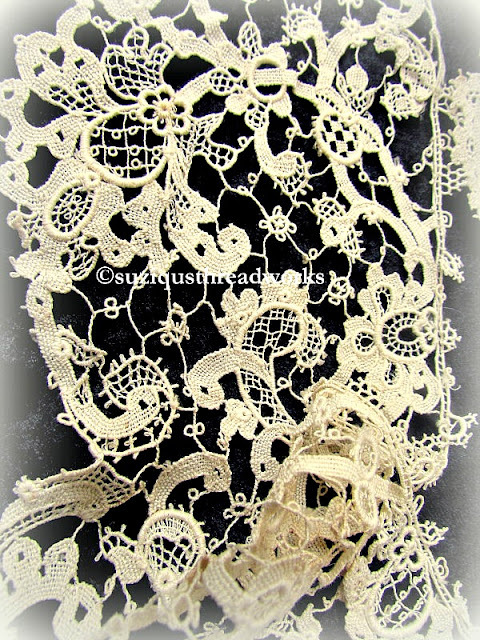 Suzy this lace is so gorgeous. Your so lucky to receive such delicate and precious collars. I think i should frame it or display it another way. Such old lace deserves a special place all the work that someone once had by making it. 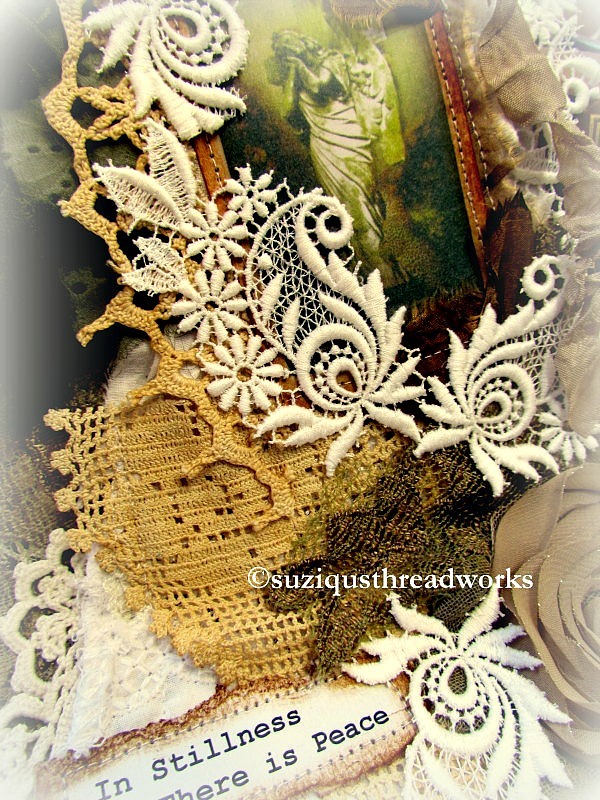 Your collage is so beautiful you gave the lace from the wedding gown a special place. Suzy I was just watching a PBS series show tonight, period piece from the 1800s, and there was a woman wearing a piece of lace that looks something like that long, curved piece above in her hair. She had her hair pulled up, and the lace piece was kind of pinned over it, with both sides falling down in the back. I don't know what that style is called, but it might be what your piece is. 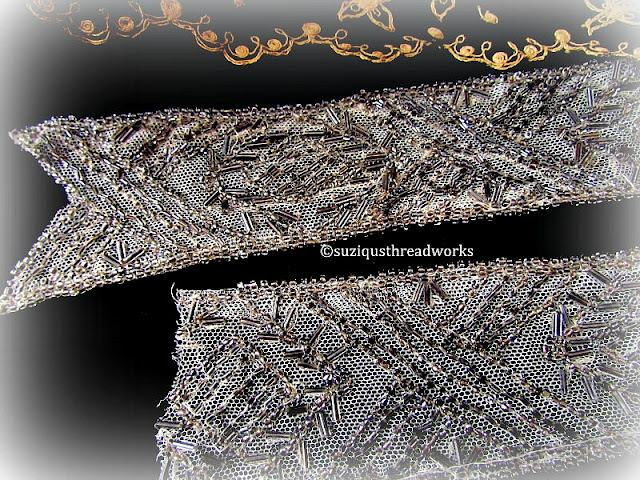 I think you will find the long pieces are called lappets. I can't imagine anybody wanting to part with such incredibly beautiful antique pieces, but boy, am I glad they went to you, someone who really loves and appreciates these things. The stunning collage you created with a few pieces of the beautiful gifts you received will be much loved by the recipient, I am sure. 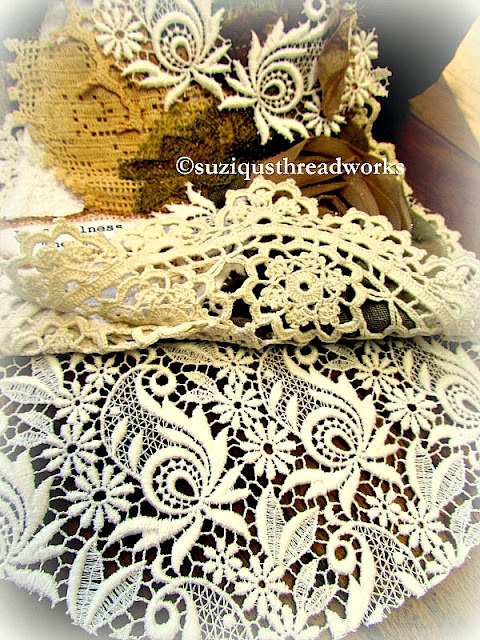 Beautiful, beautiful lace Suzy! What an incredible gift you have received. I am also in awe of how lovely it is, and how old. The collage you created certainly does justice to the beauty of the lace - the perfect showcase! Also, whenever I reply to your comments the emails have been coming back as "undeliverable". I tried copying and pasting the link from your blog but one or two days later those emails come back as well... so I want you to know just how much your comments of late have meant to me. So very kind and thoughtful and brought me comfort. 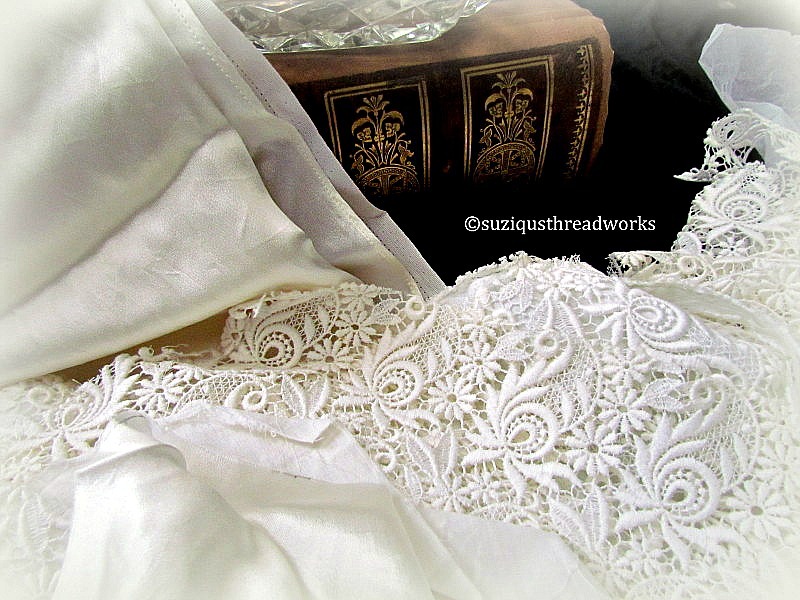 Dear Suzy, such wonderful lace, that was a fantastic gift to get, your new collage is so beautifully made with the wedding dress lace, what a wonderful tree with so many flowers,it must be a joy to look at it, wish you a lovely weekend. Oh Suzy your weeping cherry is the prettiest I've ever seen. Have you had it a long time? They can get so big after many years. You are a lucky girl to be gifted such lace...my goodness I was drooling all over my computer here. I love that you made something wonderful to give her and to pass down. ps hope your maggie showed up. I was very late in sending it but hope it's not lost. My goodness! The lace looks simply divine. What a magnificent and generous gift. I am sure that your collage will be a success for your friend. So beautifully designed! Dear Suzy, I wish you a nice weekend. 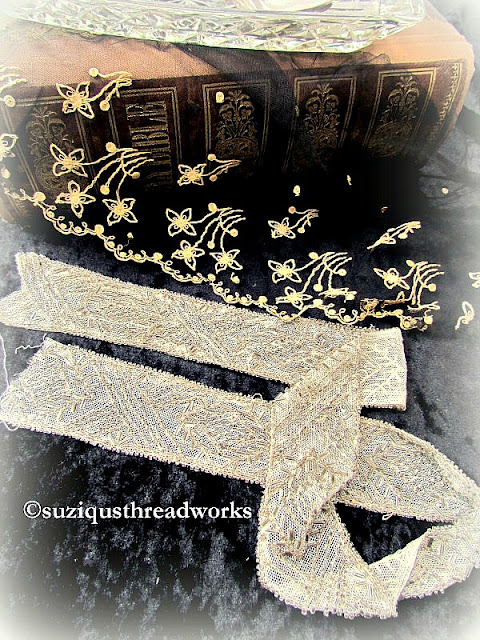 When I handle such treasures, I try to get an image in my mind of how these things adorned the clothing of it's owners from so many years past. It gives us a connection to those who came before us. You are so very blessed. 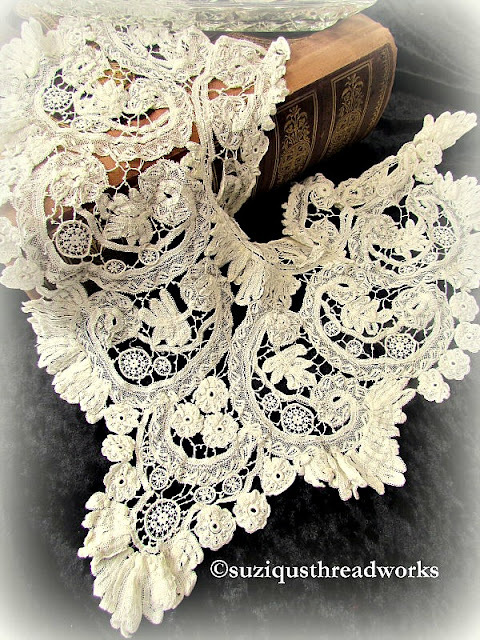 Your lace collection is gorgeous. I did a Google search on lappets as one lady suggested, and that does look like what your long pieces are. Check out the Google images, there is also a Lappet Faced Vulture that has to be one of the homeliest creatures that i have ever seen. How wonderful a friend you have to give you all these exquisite pieces. I'm sure she will love your gift to her. I shall be looking forward to seeing you work with this tresure trove. incredibly beautiful lace collars, Suzi! How wonderful to have them. Such beautiful lace from Di! 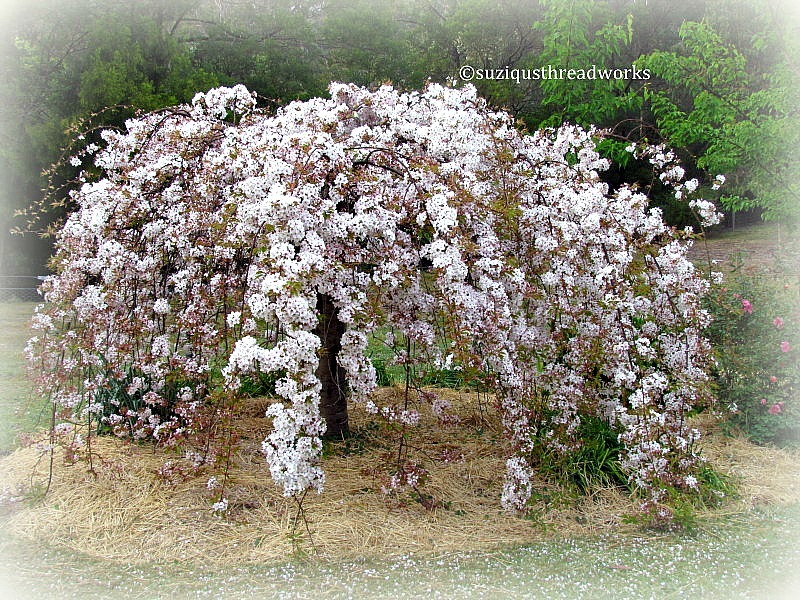 Your collage is so lovely, as is your lacy tree. Have a wonderful week. Swoon! 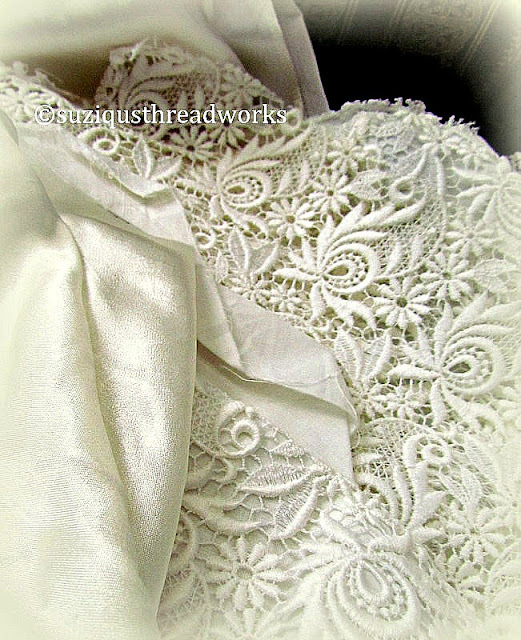 I love that lace! These are the Crème de la Crème - what a wonderful gift - and couldn't have been gifted to a more deserving artiste. 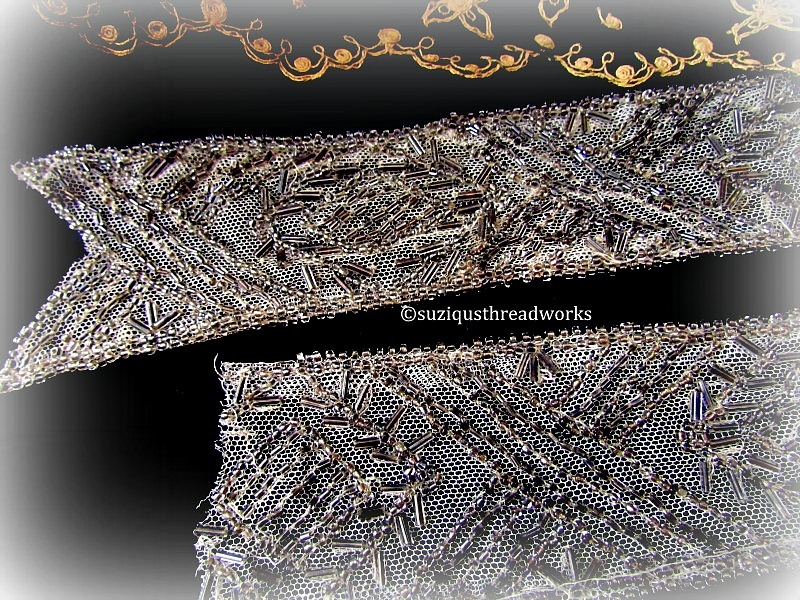 You will breathe new life into these precious pieces and make the most of their beauty. Your weeping cherry is a sight to be seen too and I agree it is natures take on lace, just as precious as the fabric ones. 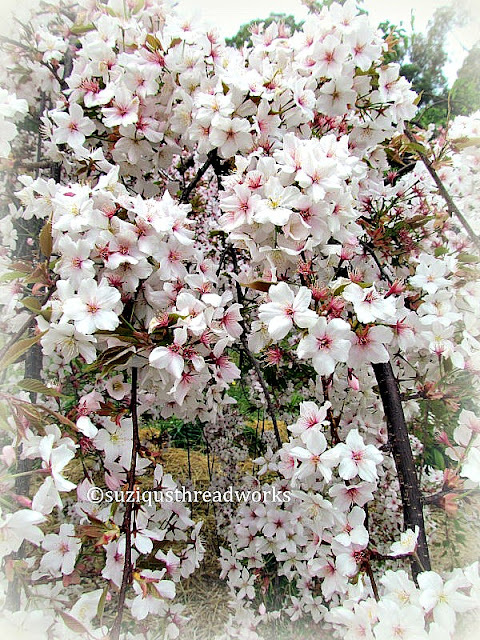 A wonderful announcement of Spring in your garden! A beautiful post and feast for our eyes! What a generous gif...these laces are a dream, Suzy! Those lace pieces are stunning Dear Suzy. So so pretty and delicate. How lucky you were. 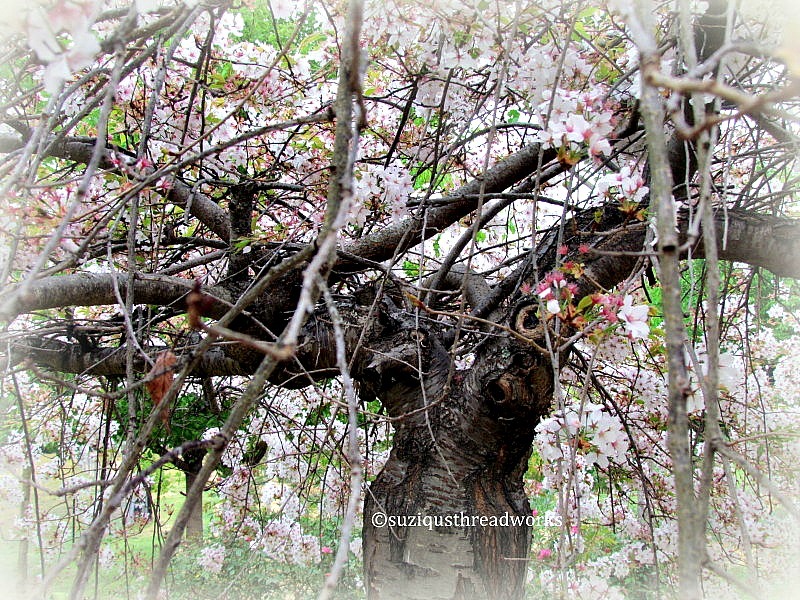 Love the photos of yoyr wonderful blooming trees. 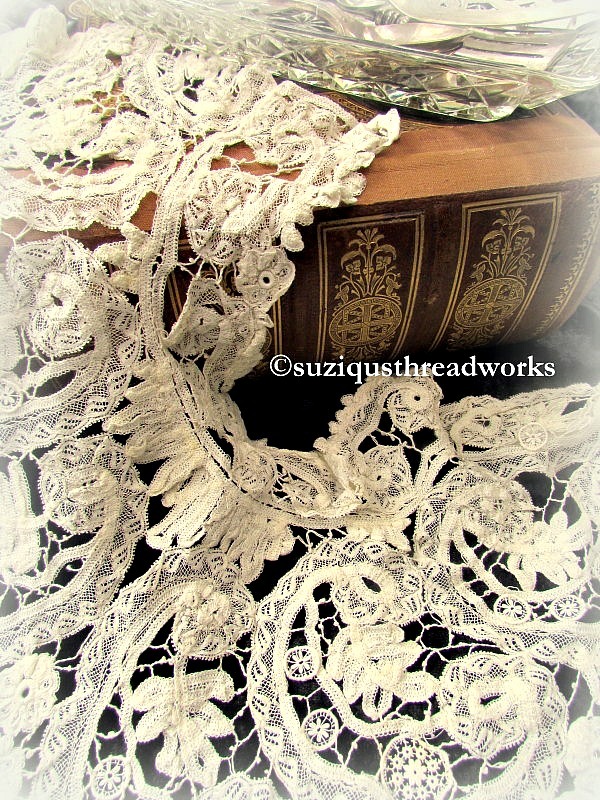 Suzy- these lace pieces are magnificent- you must be thrilled to call them your own-- what a wonderful gift from your friend. 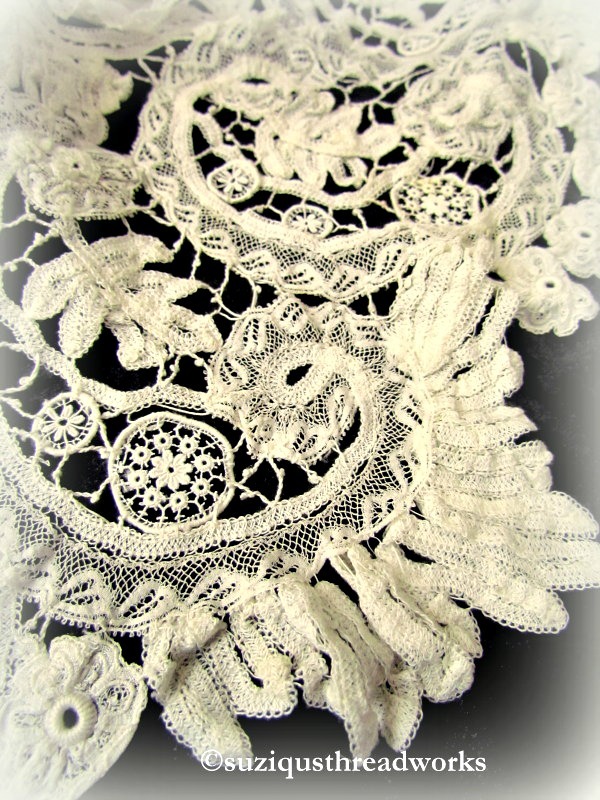 You certainly made a lovely collage using the lace- I'm sure your gift will be treasured. 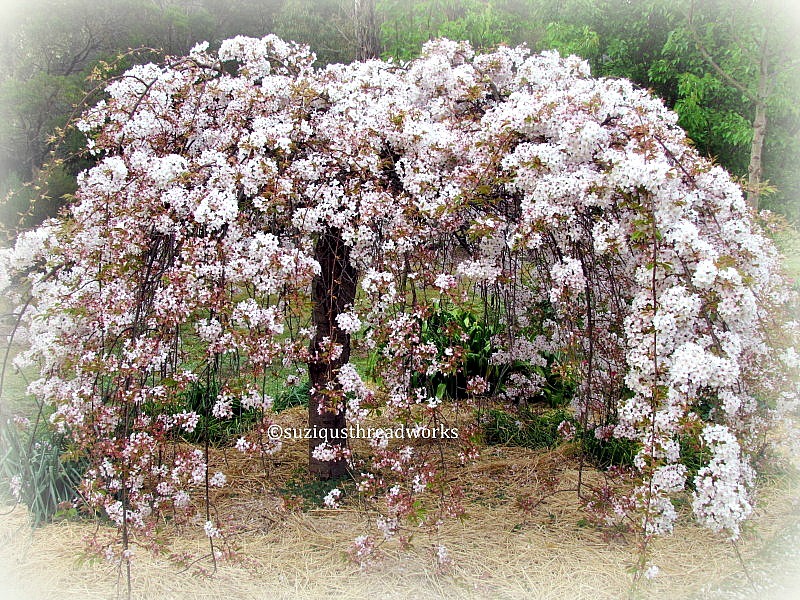 The weeping cherry tree is gorgeous-- oh my goodness-- what a display of color and flowering branches!! 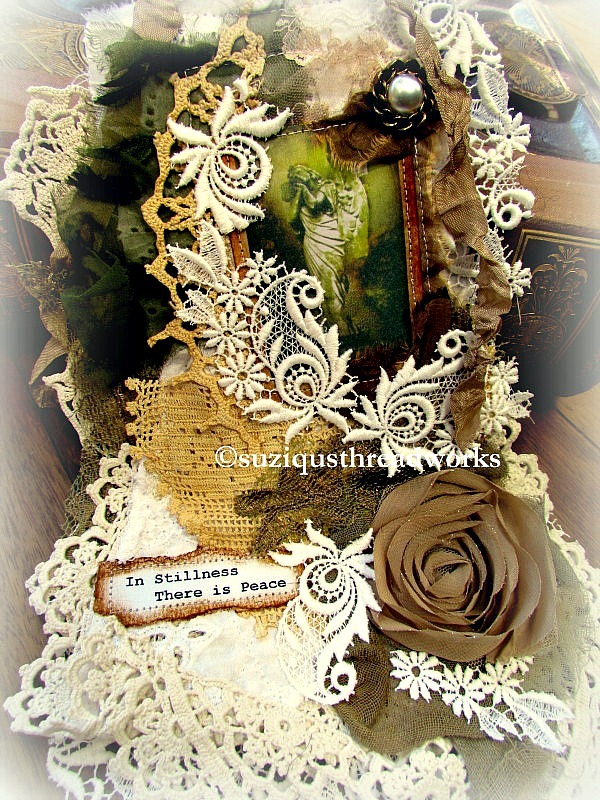 A new Journal "Silent Prayer" to show you!